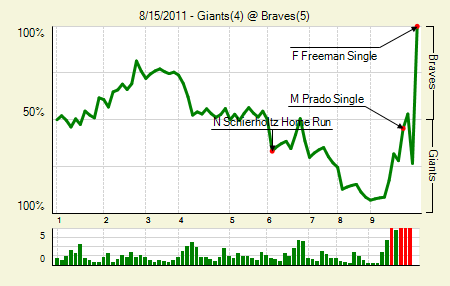 Moving the Needle: Freddie Freeman walks off with a two-RBI single, +.733 WPA. There is nothing quite like the multi-run come-from-behind victory in the bottom of the ninth. The Braves got that last night, as they entered the frame down two. A single, walk, and sac set them up for the tie, but Martin Prado’s single only scored one. A walk and a strikeout brought Freeman to the plate, and he grounded one up the middle to bring home the two winning runs. Madison Bumgarner: 7 IP, 8 H, 2 R, 2 BB, 5 K. It seems as though his bullpen has failed him after quite a few solid starts this year. Brian Wilson ended up blowing the save. Tim Hudson: 8 IP, 5 H, 4 R, 1 BB, 2 K. He got 15 ground balls, which is pretty standard. But he also allowed 11 balls in the air, which is not. Moving the Needle: Hisanori Takahashi throws one away, -.128 WPA. The Angels have — maybe had — a chance this week to gain some ground in the AL West, since they’re playing the Rangers at home. But the first place Rangers made a statement last night, particularly in the fifth inning. 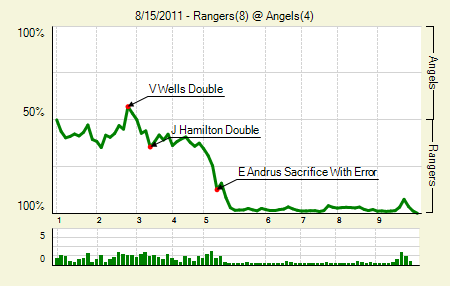 It started with a pair of singles, and then Elvis Andrus tried to bunt them over. He got it down to the left side, and Takahashi tried to get the runner at third. But he threw it away, allowing that runner to score and the trail runners to move up a base as well. The miscue started the six-run onslaught that gave Texas the game. Ian Kinsler: 4 for 5, 2 2B. He scored three times. He’s basically found a happy medium between his low-OBP, high ISO 2009 and his high-OBP, low-ISO 2010. His wOBA remains essentially the same. Michael Young: 3 for 5, 1 2B. Remember when he wanted out and the Rangers tried to trade him? Yeah. Good thing that didn’t happen. Moving the Needle: Jim Thome‘s 600th homer puts the Twins up big, +.239 WPA. We’ve seen two huge milestones this year (three if you count Jason Isringhausen’s 300th save, also recorded last night), and both were accomplished in grand fashion. Derek Jeter went 5 for 5 on his 3,000th hit day, getting the definitive one on a home run. Thome was sitting on 598 homers coming into last night’s game, and he hit 599 in the sixth, breaking a 3-3 tie and giving the Twins a 5-3 lead. 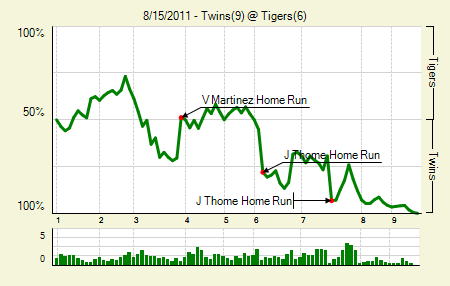 But the Tigers came back in the seventh, leaving Thome with no choice but to bust the game open. With the Twins already ahead 6-5, he blasted No. 600, a three-run shot that put them up by four. Have yourself a game, and career, Mr. Thome. Delmon Young: 2 for 4, 1 HR. He hit a homer in his first at-bat as a Tiger, but it was a solo shot and his team lost anyway. Clearly he’s not a winner. Ben Revere: 2 for 5, 1 3B. Moving the Needle: Carlos Gonalez ties the game in the ninth with a double, +.459 WPA. Down 4-3 in the bottom of the ninth, the Rockies made two quick outs. But then Dexter Fowler doubled, and Carlos Gonzalez followed with one of his own to tie the game. The best part about doubling home the tying run in the bottom of the ninth is that you yourself are in scoring position. The Marlins took no chances, intentionally walking Troy Tulowitzki before bringing in Randy Choate to face Jason Giambi. Nope. 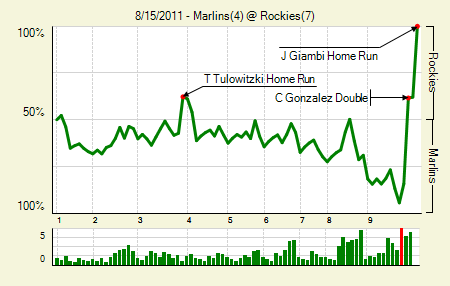 Giambi homered to end the game. Troy Tulowitzki: 2 for 3, 1 HR, 2 BB. One of the walks, of course, was intentional. He scored three times and drove in another two. Mike Stanton: 1 for 3, 1 HR, 1 BB. Moving the Needle: Derek Jeter triples to give the Yanks their lead back, +.218 WPA. The Yankees took a 2-0 lead in the second, but the Royals turned the game around the game in the fifth when they got three off A.J. Burnett. 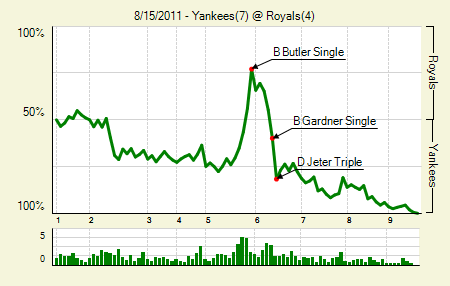 The Yankees got right back on the horse, though, as they got three straight singles in the sixth to tie the game. That brought up Jeter, who laced one into the right-center field gap, bringing around both base runners and placing himself on third base. Jeter had three hits and three RBI in the game. Robinson Cano and Nick Swisher: both 2 for 5, 1 2B. Even though he slumped badly early in the season, Swisher leads the Yankees in OBP. Melky Cabrera: 1 for 3, 1 2B, 1 BB. The walk drove in a run, as did the double. That’s one way to show your former team what they’re missing. Moving the Needle: Matt Downs gets the Astros closer in the sixth, +.221 WPA. 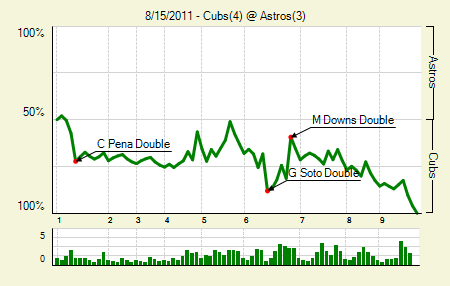 Downs basically did all of the lifting for the Brand New Astros lat night. In the fourth, with his team already down two, he doubled home a run (thanks, in part, to an error) to cut the lead. Then, after the Cubs took a 4-1 lead in the sixth, he came back with a two-run double to make it 4-3. But one man can’t do it all. Carlos Pena: 2 for 5, 1 2B. He drove in a pair. Geovany Soto: 3 for 4, 2 2B. He drove in a pair as well, including two on a double in the sixth. Moving the Needle: Robert Andino’s bases loaded double gives the Orioles a lead in the seventh, +.317 WPA. 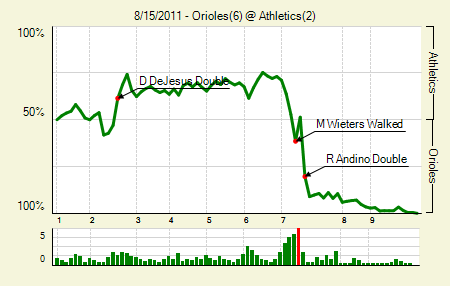 The A’s had a 2-1 lead since the second, but in the seventh the Orioles broke out. They got a pair of singles and a walk to open the inning, and then with one out Andino lined one to center and brought home the go-ahead runs. Josh Bell, who I didn’t even realize was back in the majors, followed that up with a two-run single to effectively bury the A’s. Brandon Allen: 3 for 4. All singles, sure, but he continues to make his case for playing time. Matt Wieters and Mark Reynolds: both 1 for 3, 1 HR, 1 BB. 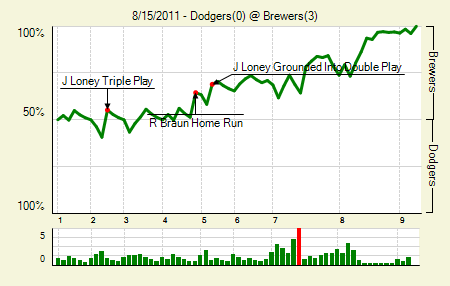 Moving the Needle: James Loney plays a sad trombone, hits into a triple play, -.146 WPA. It just wasn’t the Dodgers day. They ended the first with a double play, and then, after putting the first two men on in the second, fell victim to the triple play. It wasn’t a traditional one, really, and in most instances it would have been just two. It went 4-6-3, but then Matt Kemp, who was on second to start the play, tried to sneak home a run. The Brewers nabbed him, completing the rare feat. All three runs came on solo shots. Loney also hit into a double play in the game. Randy Wolf: 8 IP, 6 H, 0 R, 5 BB, 5 K. How do you survive five walks? By getting a triple play and three double plays. John Axford got a double play, too, in the ninth. Ryan Braun: 2 for 4, 1 HR. 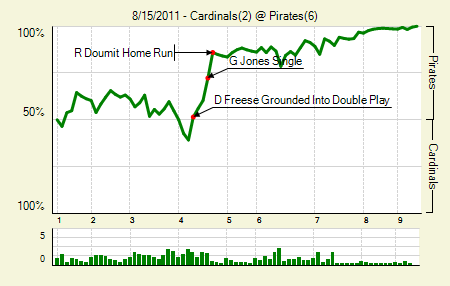 Moving the Needle: Mike Carp ties the game with a solo homer, +.356 WPA. Things got a little crazy early on. The Jays took a lead in the first, and then the Jays took it back in the third. 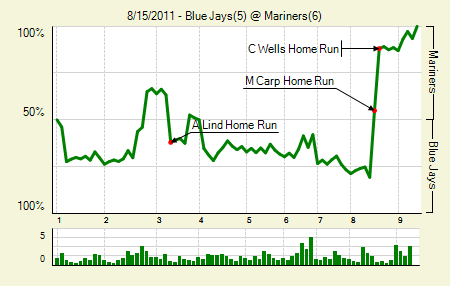 Seattle tied it in the bottom half, but the Jays re-took the lead in the fifth. That brings us to the eighth, still 5-4 Jays. With one out Carp went deep, and then Casper Wells followed it up with a jack of his own, giving the Mariners a 6-5 lead. Carp had two homers in the game. Trayvon Robinson: 3 for 4, 2 2B. Adam Lind: 2 for 4, 1 HR. He’s showing signs of breaking out of his slump, which has lasted since mid-June. Moving the Needle: Ryan Doumit’s three-run shot breaks the 1-1 tie, +.137 WPA. In the fourth the Pirates got something going with two straight singles to start the inning. That brought up Doumit, who homered to give the Pirates a 4-1 lead. The Cardinals would get one in the sixth, but they’d never get close enough. Neil Walker: 2 for 3, 1 2B, 1 BB. He had been 0 for 17 in his previous five games (four starts). Matt Holliday: 2 for 4, 2 2B. Two doubles, yet no runs and no RBI. Moving the Needle: Jesus Guzman ties the game in the eighth, +.313 WPA. The Mets had control, with a 4-1 lead in the seventh. 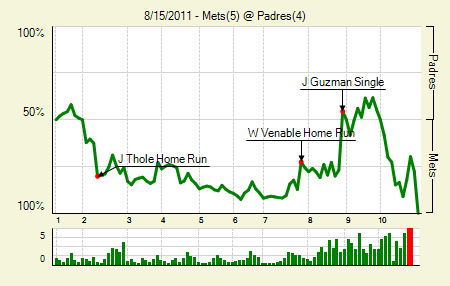 But the Padres got two in that inning, and then tied it in the eighth when Guzman singled home Orlando Hudson. The Mets, however, took the game in the 10th on a pair of walks, a sacrifice, and a fielder’s choice. Jason Isringhausen, as mentioned previously, recorded his 300th save, though ti wasn’t the easiest one. He had two on and one out in the bottom of the 10th before closing it out. Will Venable: 2 for 4, 1 HR. His homer in the seventh made the comeback possible. Lucas Duda: 3 for 4, 1 HR, 1 BB. That’s a homer in two straight games for him. We hoped you liked reading The Morning After: Game Recaps for August 15th by Joe Pawlikowski!